Built in 1986, the Jimbaran Campus is the youngest and largest campus of Udayana University. In addition to the Rectorate, the campus houses an international hospital, university library, sports center as well as numerous faculties, local and international programs. The GoBali building is located in the heart of the lush tropical international part of the campus. Recently renovated, the GoBali building is Udayana’s pride and joy. The spacious classrooms are bright, modern and fully equipped. All classrooms have air conditioning and high speed wifi. A lounge and a meeting area provide opportunities to learn or relax. Seating in the building and around the building invite you to linger. 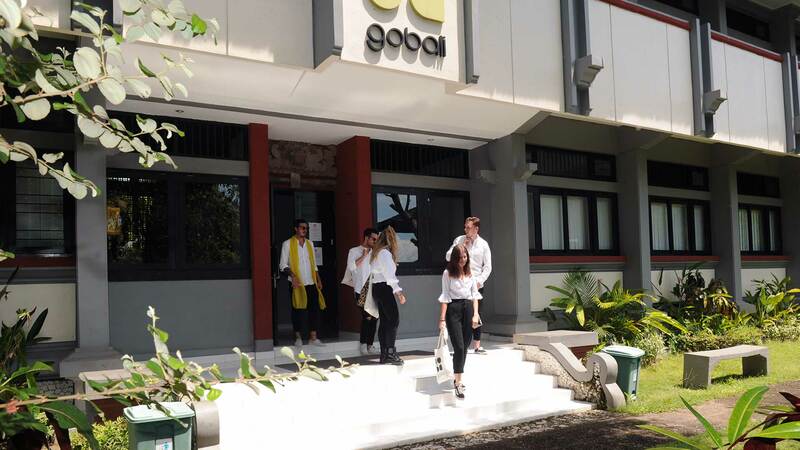 On the ground floor is the GoBali Student Office, which is open to students daily from 8 am to 4 pm. The campus location Jimbaran offers best connections to any kind of leisure activities. World famous beaches, tourist attractions, night markets, shopping malls, cafes and restaurants are only a few minutes drive away. The Ngurah Rai international airport is also just a 15-minute drive away and is the gateway to explore Indonesia and Southeast Asia.